The Columbia Glacier drains west from Columbia Icefield into British Columbia. 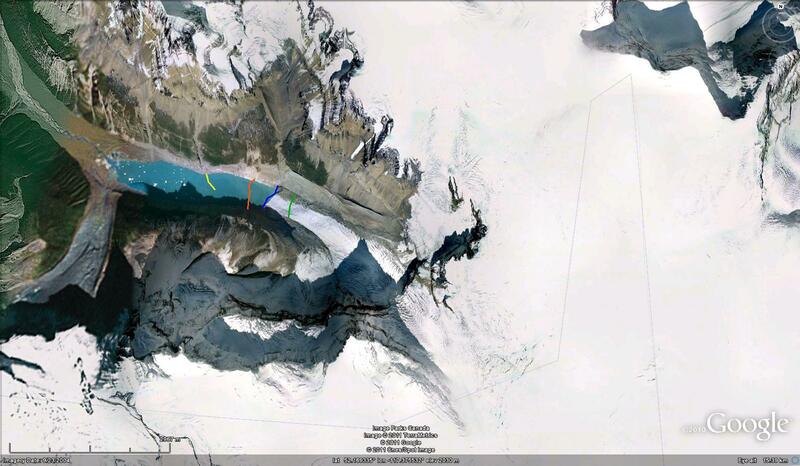 The glacier in 1964 was 8.5 km long, by 1980 9.5 km long and in 2009 6.5 km long. 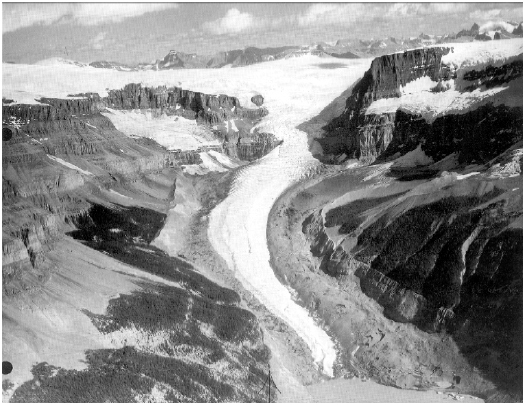 The glacier drops rapidly from the plateau area over a major ice fall, which created a series of ogives, as seen in this 1964 Austin Post (USGS) photograph. 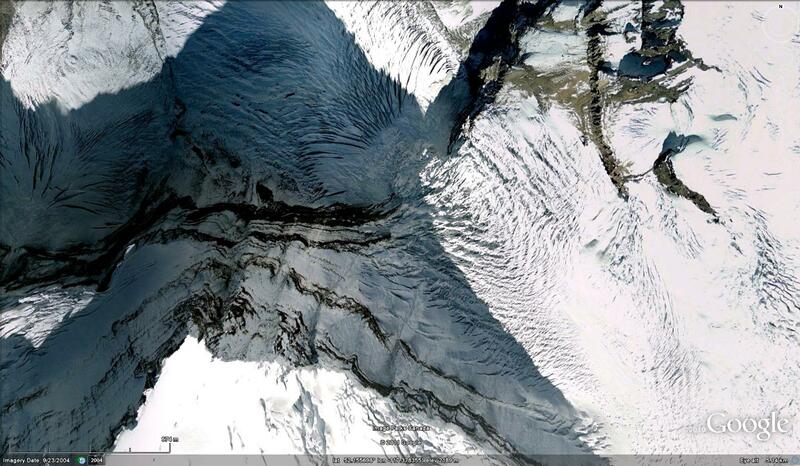 Ogives are annual wave bulges that form at the base of an icefall due to differential seasonal flow velocity. The outermost moraine emplaced by the glacier is dated to 1724. By 1924 the glacier retreated 400 meters and then an additional 1300 meters by 1950, according to Ommaney, 1980 (page 225 of link). Ommaney (page 251) noted that the glacier than advanced over one kilometer from 1966 to 1980 the glacier again completely fill the large proglacial lake. 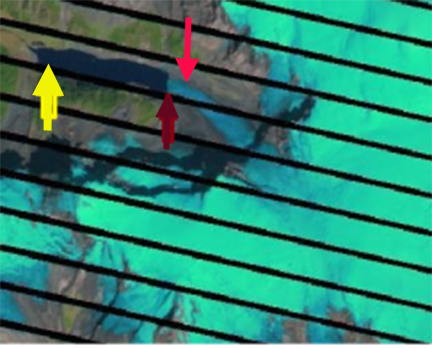 A comparison of 1985 and 2009 Landsat images indicates the change in terminus position and lake size. The yellow arrow is the 1985 terminus, red arrow the 2009 terminus and pink arrow 2013. The black lines in the 2009 image are scan line errors. There is a 3000 meter retreat in the 25 years and 300 meters from 2009-2013. The lake is now 4 km long. Tennant and Menounos (2013) examined changes in the Columbia Icefield 1919-2009 and found a mean retreat of 1150 m and mean thinning of 49 m.
That is 120 meters per year 1985-2009, and 75 m per year 2009-2013. 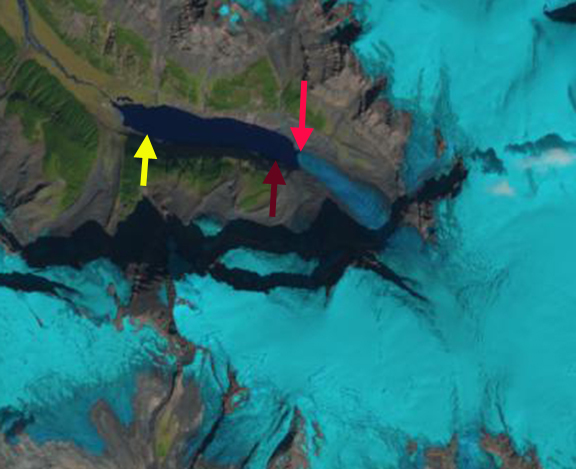 By 2001 satellite imagery indicates a proglacier lake that is 2700 meters long ending at the terminus (top image). In the 2004 Google Earth image the terminus had retreated 300 meters, middle. 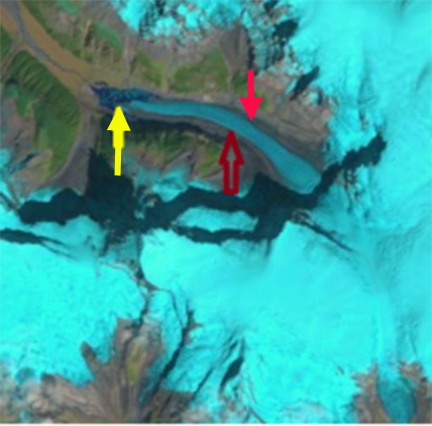 In 2009 Landsat imagery indicates a further 500 meter retreat. In the images below the yellow line is the 1964 terminus, orangeis 2001, blue is 2004 and green is 2009. 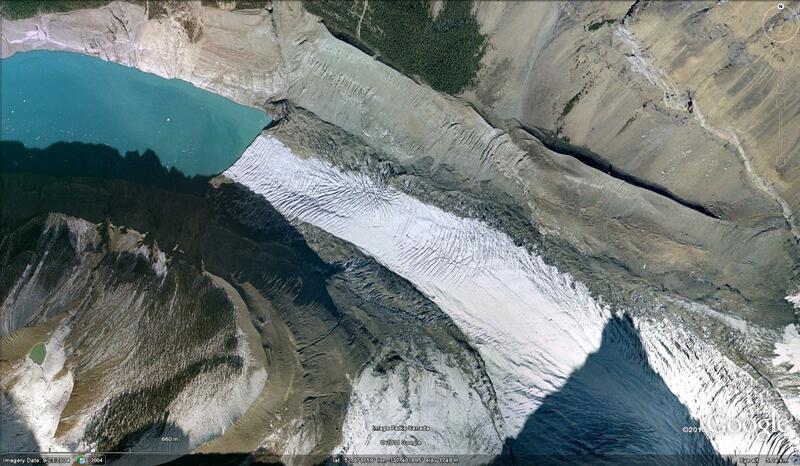 Thus, Columbia Glacier, British Columbia has retreated at least 800 meters in the last decade (bottom image). 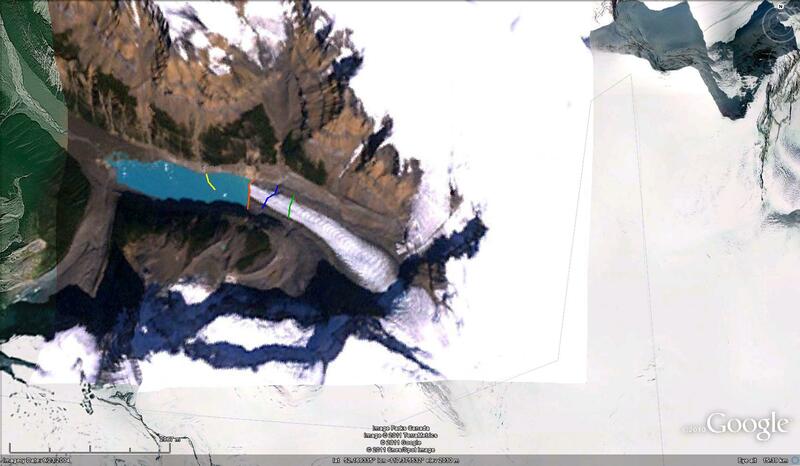 A further change is noted in the absence of ogives at the base of the icefall. 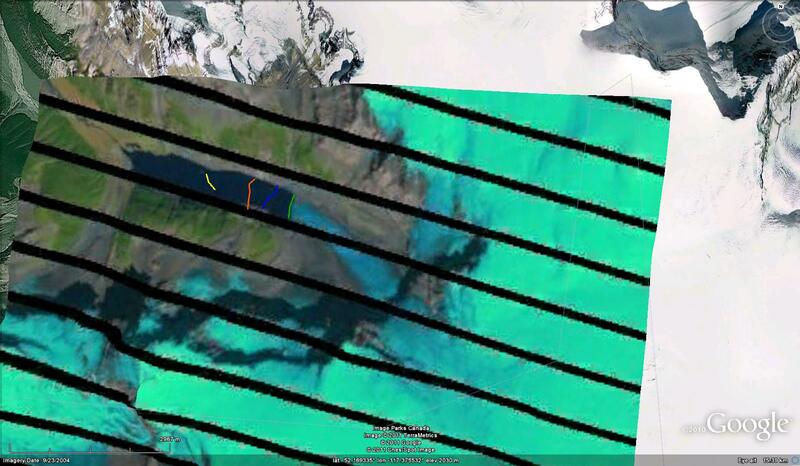 As the icefall has narrowed and slowed the result has been a cessation of this process. The current terminus is still active with crevassing near the active front. The glacier does lose ice to calving as the glacier reaches the end of the depression filled by the lake, its rate of retreat should slow. At the current retreat rate that will be within the next 10-20 years. Examining the surface elevations and crevasse patterns of the lower glacier, there is no sign that the lake will not continue to expand for at least another kilometer. This entry was posted in Glacier Observations and tagged columbia glacier global warming, columbia icefield global warming, columbia icefield lake expansion, columbia icefield ogives, columbia Icefield Retreat. Bookmark the permalink.